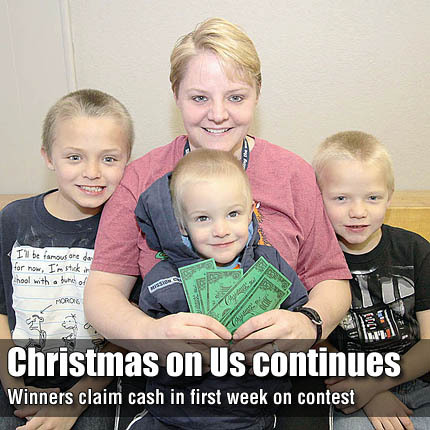 Michelle Hoopes, Osage City, and her sons Isaac, 9, Joshua, 7, and Alex, 2, came in to The Osage County Herald-Chronicle office to claim their $50 instant prize Monday. Each of the winning tickets from last week’s edition were claimed by Osage County shoppers. The other three $50 winners were Danielle Garrison, Overbrook; Johnni Tosh, Vassar; and Linda Ullery, Scranton. OSAGE CITY—The annual Christmas on Us contest is in its second of four weeks and $200 has already been awarded to four lucky Osage County shoppers. All four ticket numbers that were hidden in ads last week were found and claimed. Each of the winners received $50 in scrip to be spent at any of the participating Christmas on Us business sponsors. Johnni Tosh, Vassar, claimed one of the four numbers hidden in last week’s advertisements. Tosh’s ticket was pulled from those collected at Dr. Lenahan and Associates, in Lyndon, and the number was hidden in the Casey’s General Store advertisement. Tosh said she would spend her winnings to buy Christmas presents. Linda Ullery, Scranton, was another winner, with her ticket pulled from those collected at Jim’s Garage, in Scranton. The number was hidden in the T-N-T Video advertisement. Ullery said she would use her $50 in scrip money to buy groceries from one of the contest’s sponsors. Danielle Garrison, Overbrook, was the third winner, picking up her winning ticket from Santa Fe Trail Meats, in Overbrook. The winning number was located in an advertisement for Santa Fe Trail Meats, and Garrison said she would likely spend the prize at the same place she obtained the ticket. The fourth winner was Michelle Hoopes, Osage City, and her three sons. Her winning ticket number was pulled from those collected at Branine Chevrolet Buick, in Osage City. The number was hidden in Hannah Auto Repair’s advertisement. Hoopes said she will use the scrip money on Christmas presents for the boys. Six $50 instant prizes remain up for grabs as the second week of The Herald-Chronicle’s Christmas on Us promotion begins. The countdown is underway for the grand prize drawing for two $1,000 prizes, and two $250 prizes, to be held 9 a.m. Saturday, Dec. 17, at Osage City High School auditorium. Everyone is invited for donuts and coffee served in the school cafeteria, and local entertainment will add to the holiday festivities. See pages 2B-5B of this week’s Herald-Chronicle to find hidden ticket numbers in the ads and a complete list of rules. Through the Christmas on Us giveaway, Osage County merchants are making sure that shopping at home pays. Not only do shoppers save money, gas and frustration by shopping at home, they have a chance to win part of the $3,000 being given away in the contest. For every $10 spent at participating merchants, shoppers get a ticket. Those who don’t buy, or who are just looking, can get a free ticket each week by stopping by The Herald-Chronicle’s office. No purchase is necessary to win. You must be present at the grand prize drawing to win, and the scrip money is only good at participating merchants. It is simple to win but tough to decide where to spend the winnings with the 37 merchants participating in this countywide contest.